Pharma Marketing Blog: How Many Adverse Event Reports Are Submitted to the FDA? Whatever the Answer, It's at an All-Time High! How Many Adverse Event Reports Are Submitted to the FDA? Whatever the Answer, It's at an All-Time High! I've been tracking the number of adverse event reports (AERs) submitted to the FDA over the years based on data supplied by the FDA here. The latest update of that data was made in November 2015 showing the number of AERs FDA received in the first quarter (Q1) of 2015. According this analysis, about 2.25 million AERs were submitted by healthcare professionals (HCPs) and consumers in 2015. An analysis by the Milwaukee Journal Sentinel and MedPage Today, however, yields drastically different numbers. 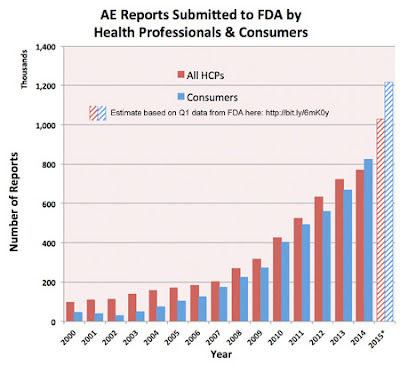 According to that analysis only 1.19 million AERs were submitted to the FDA in 2015 (see embedded story at the end of this post). That's only half of what I find based on my analysis. Perhaps the Sentinel analysis is only looking at reports submitted by HCPs, which would make its results jibe with my estimate. However, the Sentinel says there were 206,000 AERs submitted in 2006. FDA data on the page I cite at the beginning of this post indicates that there were 311,156 AERs submitted by HCPs and consumers in 2006 (184,238 of these were submitted by HCPs). I'm not sure why there is this discrepancy. Perhaps the Sentinel analyzed the raw quaterly data files found here. But that doesn't make sense because 2016 data are available on that page, but the Sentinel said "Numbers aren’t final for 2016," which implies it did not use the quarterly data. Whatever! Adverse event reporting is at an all-time high and growing.